IDWedgePro Software - Multi Form AutoFiller - IDScanner.com by TokenWorks, Inc. 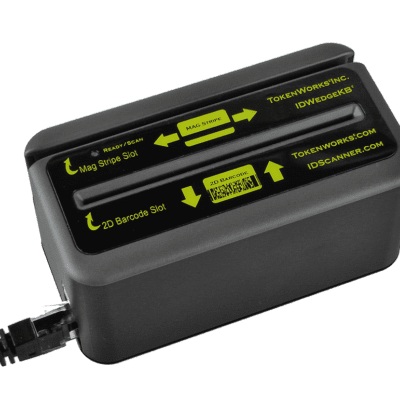 When combined with a hardware IDWedge®Pro scanner (sold separately), the IDWedge®Pro form filler solution scans drivers licenses, ID cards, credit cards and other magnetic striped cards and fills multiple computer forms with information from the card. It automatically recognizes and populates forms in multiple PC applications, allowing different applications to share the same ID scanner. It works with any PC application that accepts keyboard input. The IDWedge®Pro software solution AutoFills multiple computer forms with ID card and payment card information. The IDWedge®Pro software, when combined with one of the IDWedge®Pro scanners (sold separately), scans drivers licenses, ID cards, credit cards and other magnetic striped cards and fills multiple computer forms with information from the card. It automatically recognizes and populates forms in multiple PC applications, allowing different applications to share the same ID scanner. It works with any PC application that accepts keyboard input. Building on Tokenworks’ industry-leading data entry solution IDWedge®, the IDWedge®Pro software adds new features like the ability to fill multiple forms on the same computer, capture images of the card (using m280 hardware), pause command to synchronize dataflow, advanced magnetic strip parsing, 1D bar code parsing, and date/time stamp fields.